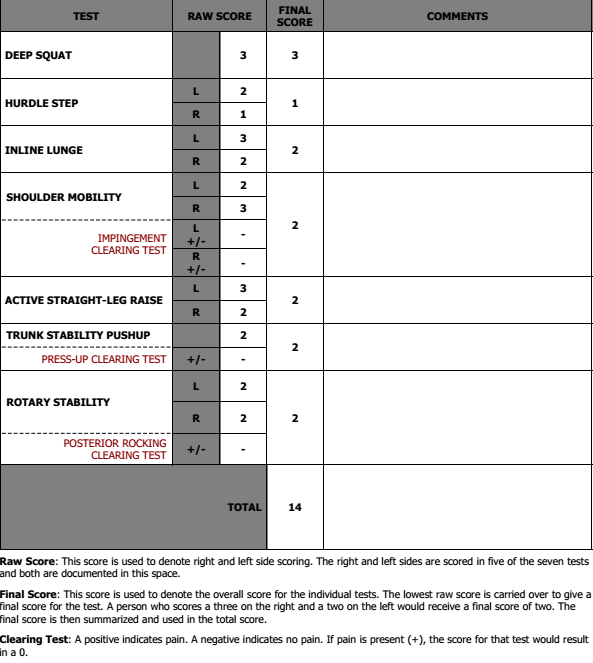 As part of my “reset” and refocusing on my fitness goals, my trainer assessed me based on the Functional Movement Systems (FMS) program. For those who are interested, check out their website, its pretty interesting. He is actually certified to do these assessments. You can get a possible 21 points for a perfect score. I received a score of 14. I’m pretty proud of myself. If I had a bit more symmetry, I would have received an 18! This will allow us to see the things we need to maintain, the things we need to strengthen, and where my form needs correcting. I’m excited to see what we can accomplish with the assistance from this assessment system. Have you heard of FMS before? What tools do you use to measure your progress? This entry was posted in Training and tagged exercise, FMS, goals, personal training. Bookmark the permalink. Wow, this is so cool! I’ve never heard of FMS, but it’s a great tool!! You’re awesome, too!! Way to go!! Sounds like a good idea, this could help identify muscle groups you need to work on. I wouldn’t have scored as well as you did, I am horrible at straight leg raises. Oh, don’t let the score fool you, that was probably very generous scoring.